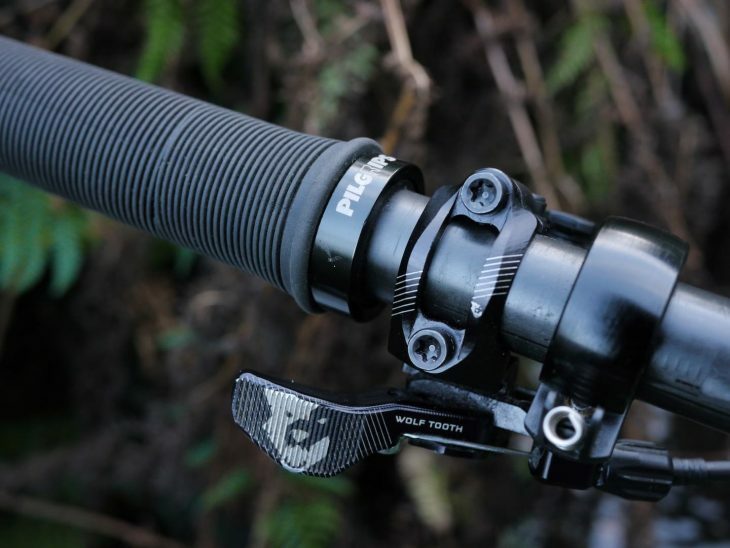 A lever blade may seem like an odd thing to review, but as one of the contact points for your bike, it’s important. 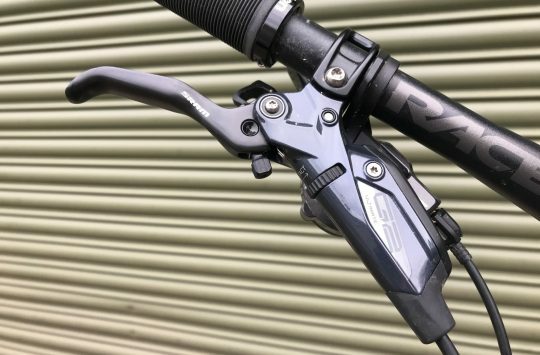 Magura started offering these single finger HC levers as an upgrade a few years ago, over the (at the time) stock two-finger levers, which were much more suited to big hands than small ones. 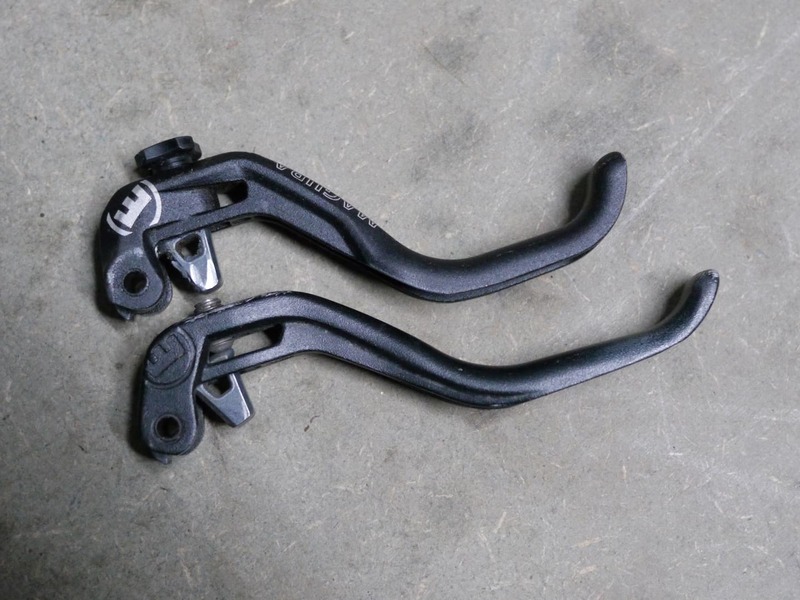 I’ve got a set of Magura MT7 brakes on my personal bike, so Magura sent a set of the upgraded levers for me to try out. The original 2-finger lever blade (bottom) and the 1-finger HC lever blade (top). Fitting isn’t as simple as some other brands, because Magura lever blades are secured by round metal pins that need to be pressed or tapped in or out. The pins sit within a bushing, and are covered top and bottom by thin, rigid, adhesive metal covers. Kind of like very thick foil stickers. 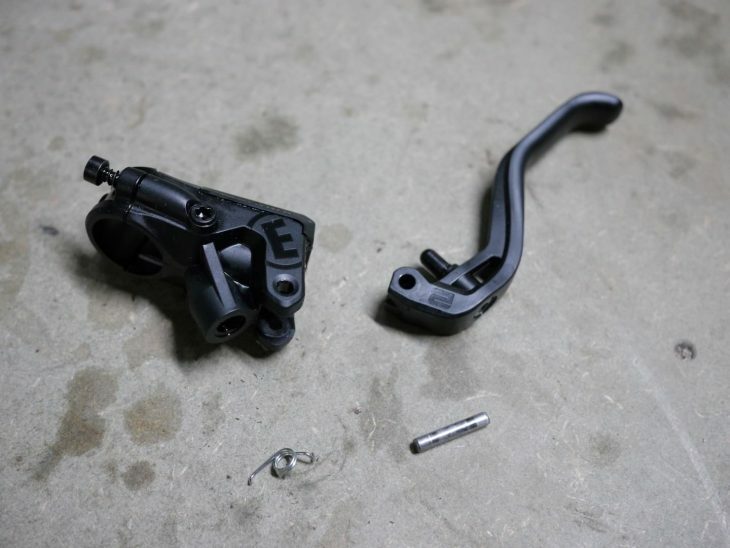 The master cylinder bodies are Magura’s Carbotecture, which means they’re carbon fibre reinforced themoplastic. It’s certainly very tough, and as three years of riding these MT7’s attest, up to the stresses of hydraulic braking. Magura’s lever blade fitting video tutorial shows the pins being bashed in and out with a deadblow hammer and a tiny punch. Nonetheless, handling them I just couldn’t escape the thought that they were plastic. I got nervous and, since I have one around, used a pillar drill as a press so I could be more gentle and precise. In all, doing both was a fairly quick job. The process is actually pretty quick and easy though. If you’re wary of DIYing things, this procedure is simple enough, but definitely more complicated and nerve wracking than swapping lever blades from other manufacturers that use machine screws or the like. 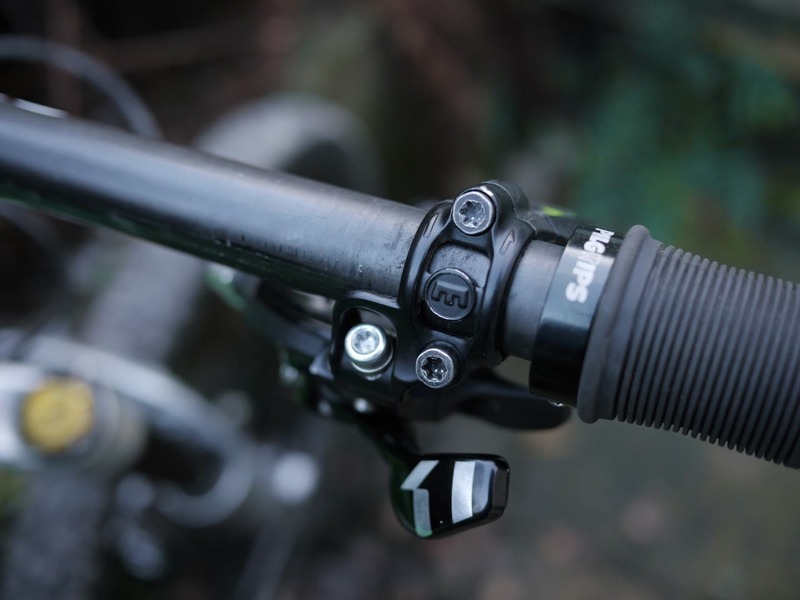 I’ve since added the Magura Shiftmix clamp to direct-mount the shifter to the lever clamp. Since installing these, I’ve also added Magura Shiftmix clamps and a Magura specific Wolftooth dropper remote, visible in some of these photos. A Shiftmix setup wasn’t strictly necessary to achieve a good setup, but it is very tidy and convenient. 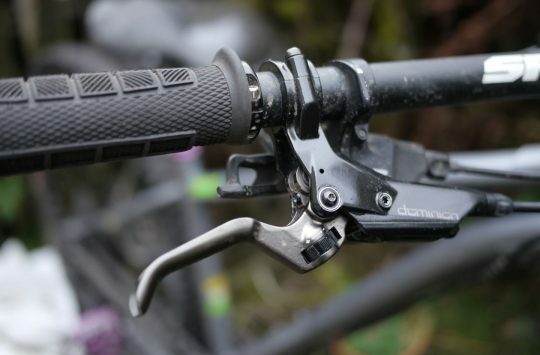 Even without this kind of tidying, the shorter levers immediately lent themselves to a much better control setup. As mentioned, the old style levers could manage one finger braking if you had big enough hands, but they were rather flexy and you had to run the clamps quite far inboard. 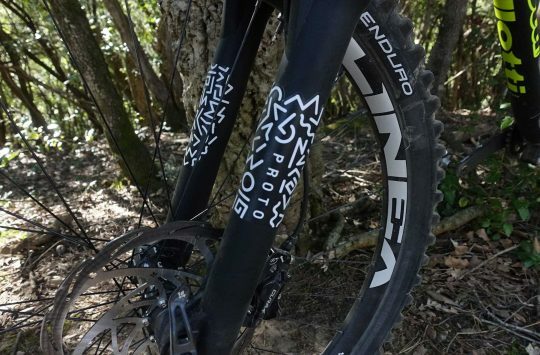 This meant the brakes ended up feeling on-or-off, as modulation could get a little vague, and MT7s are extremely powerful. Even before the Shiftmix clamps, the shorter HC levers meant I could get my shifter and dropper remote into better positions than before. Weight weenies beware, these lever blades weigh 29 grams each, which is a whopping 3 grams more than Magura’s two finger blade. I’ve also been testing the Magura-specific Wolf Tooth ReMote, which has tidied up the cockpit nicely. ‘The Feels‘ section of this review is for members only. If you have an account, please log in. If not, you can get access by registering here for free. “stifferer” – new technical term? 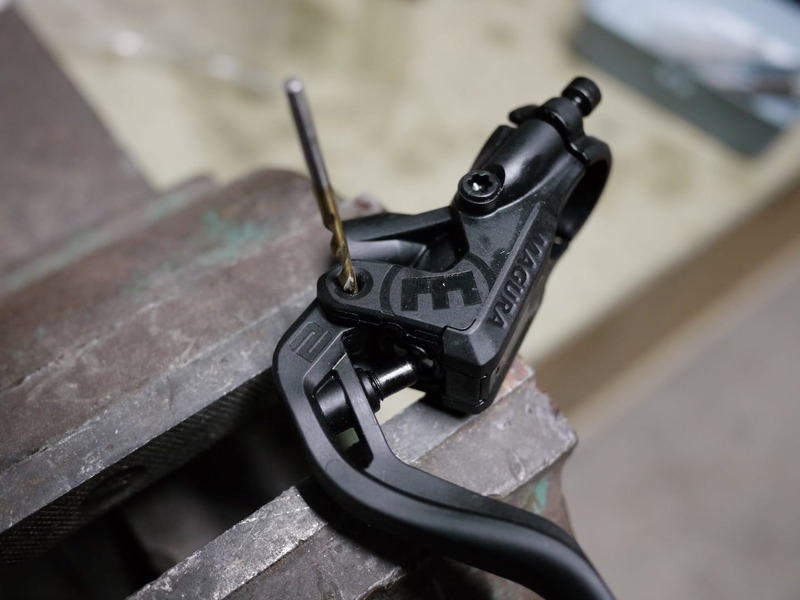 😉 Always been a Magura fan – in fact I’ve never bought anything else since the first Martas but lately they seem to be going from strength to strength!